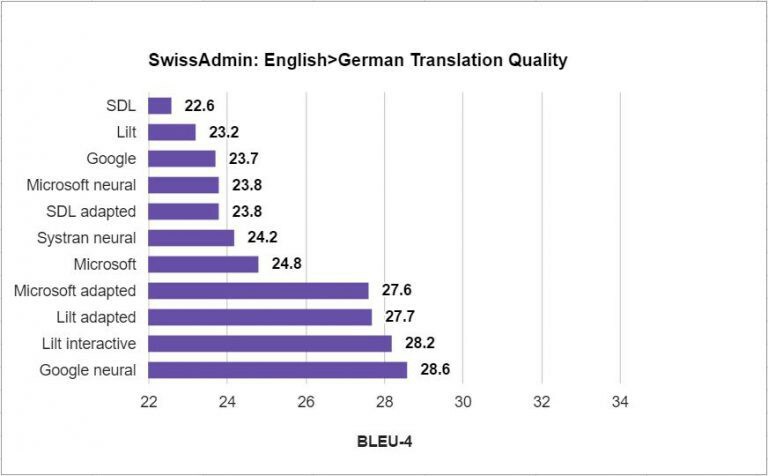 This post is an addendum to our original post on 1/10/2017 entitled 2017 Machine Translation Quality Evaluation. 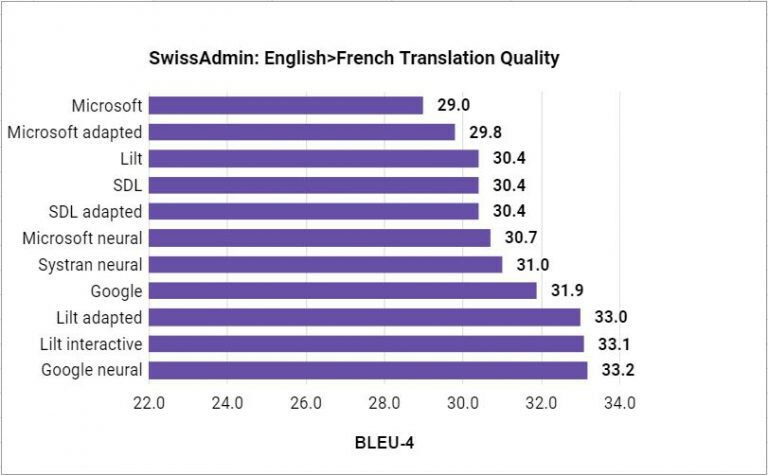 We evaluate all machine translation systems for English-French and English-German. We report case-insensitive BLEU-4 , which is computed by the mteval scoring script from the Stanford University open source toolkit Phrasal. NIST tokenization was applied to both the system outputs and the reference translations.We simulate the scenario where the translator translates the evaluation data sequentially from the beginning to the end. We assume that she makes full use of the resources the corresponding solutions have to offer by leveraging the translation memory as adaptation data and by incremental adaptation, where the translation system learns from every confirmed segment. System outputs and scripts to automatically download and split the test data are available at: https://github.com/lilt/labs. Production API keys and systems are used in all experiments. Since commercial systems are improved from time to time, we record the date on which the system outputs were generated. Systran’s “Pure Neural” neural machine translation system. The system can be reproduced through the demo website. We manually copy-and-pasted the source into the website in batches of no more than 2000 characters. We verified that line breaks were respected and that batching had no impact on the translation result. This comprised considerable manual effort and was performed over the course of several days. SDL’s Language Cloud machine translation system. The system can be reproduced through a pre-translation batch task in Trados Studio 2017. SDL’s “AdaptiveMT” machine translation system, which is accessed through Trados Studio 2017. The system can be reproduced by first creating a new AdaptiveMT engine specific to a new project and pre-translate the test set. The new project is initialized with the TM data. We assume that the local TM data is propagated to the AdaptiveMT engine for online retraining. The pre-translation batch task is used to generate translations for all non-exact matches. Adaptation is performed on the TM content. In the adaptation-based experiments, we did not confirm each segment with a reference translation due to the amount of manual work that would have been needed in Trados Studio 2017. The Lilt adapted, Microsoft adapted and SDL adapted systems are most comparable as they were adapted in batch mode, namely by uploading all TM data, allowing training to complete, and then decoding the test set. Of course, other essential yet non user-modifiable factors such as the baseline corpora, optimization procedures, and optimization criteria can and probably do differ. Sample a subset of sentences and compare the MT output to the references. Starting in November 2016, we evaluated the eight public datasets described in the Appendix with respect to these criteria. The ninth corpus that we tried was SwissAdmin, which both satisfied our requirements and passed our data selection procedure. SwissAdmin is a multilingual collection of press releases from the Swiss government from 1997–2013. We used the most recent press releases. 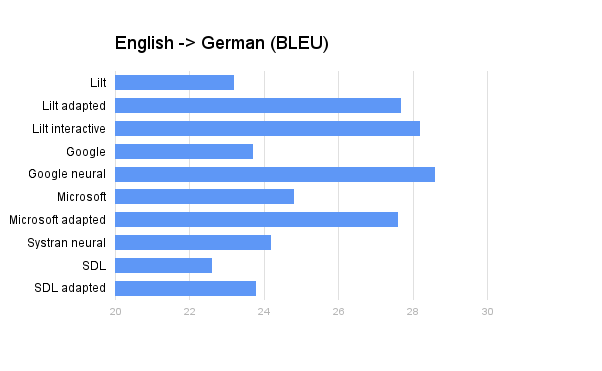 We split the data chronologically, reserving the last 1300 segments of the 2013 articles as English-German test data, and the last 1320 segments as English-French test set. Chronological splits are standard in MT research to account for changes in language use over time. The test sets were additionally filtered to remove a single segment that contained more than 200 tokens. The remainder of articles from 2011 to 2013 were reserved as in-domain data for system adaptation. 1 We were unable to produce an SDL interactive system comparable to Lilt interactive. We first tried confirming reference translations in Trados Studio. However, we found that that model updates often requires a minute or more of processing. Suppose that pasting the reference into the UI requires 15 seconds, and the model update requires 60 seconds. For en-de, 1299 * 75 / 3600 = 27.1 hours would have been required to translate the test set. We then attempted to write interface macros to automate the translation and confirmation of segments in the UI, but the variability of the model updates, and other UI factors such as scrolling prevented successful automation of the process. The absence of a translation API prevented crowd completion of the task with Amazon Mechanical Turk. Neural Machine Translation is everywhere (and not just on this blog). Translators want to know how it will affect their livelihood, and internal localization managers want to know how they can make it work for their translation strategy. 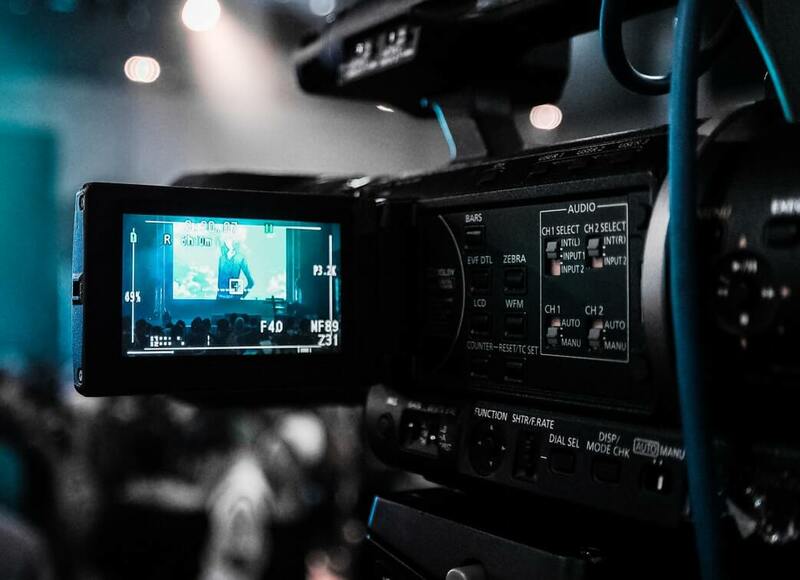 Whether you're looking to assess the business applications of neural machine translation, or peek under the hood to see how all the gears fit together, these NMT videos can help you wrap your head around the rising tide that is neural machine translation.